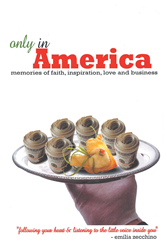 “Only in America” from Christian Faith Publishing author Emilia Zecchino is an inspiring memoir that details the author’s rags-to-riches immigration story as she survives war-torn Ethiopia and Italy before coming to America and making her professional culinary dreams come true. Published by Christian Faith Publishing, Emilia Zecchino’s new book is an encouraging story about following one’s heart through the ups and downs and listening to the little voice that always seems to know where one should go next. Zecchino’s moving account is a powerful yet humble reminder of how the land of opportunity truly changes everything for those who are persistent, passionate, and faithful. View a synopsis of “Only in America” on YouTube. Consumers can purchase“Only in America” at traditional brick & mortar bookstores, or online at Amazon.com, Apple iTunes store, or Barnes and Noble. For additional information or inquiries about “Only in America”, contact the Christian Faith Publishing media department at 866-554-0919.